Another birthday! Little Brother turned 7 and we had his party over the weekend. We tossed around a few theme ideas and decided on Weather. Sort of an unusual birthday theme, but, surprisingly, it offered a lot of fun ideas to try. 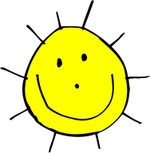 Little Brother is "walking sunshine", always smiling and laughing and happy, so the theme seemed appropriate for him. First, some fun information at Weather Trivia. The fact that fascinated me the most was this one, "The amount of sunlight reaching the earth's surface is 6,000 times the amount of energy used by all human beings worldwide. The total amount of fossil fuel used by humans since the start of civilization is equivalent to less than 30 days of sunshine." What were we ever thinking using fossil fuels when Mother Nature has provided us with an overabundance of free, clean energy to use? Astounding! Anyway, back to the party... we made wind chimes... I bought embroidery hoops from the thrift store (very cheap) and collected an assortment of "dingers". 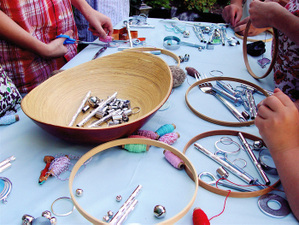 Metal cookie cutters, a variety of bolts and washers, serving forks, etc. 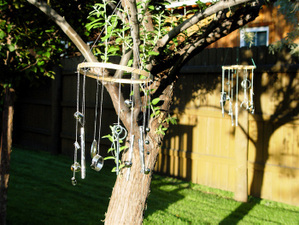 I bought some inexpensive windchimes and cut off the chimes to use, too. You can use fishing line to tie the pieces on, but I thought these threads were a colorful touch. I also thought it might be nice to paint the hoops ahead of time, too, but didn't think of that until it was too late! 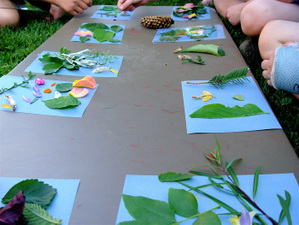 Next, we made sun prints. I bought the paper at a toy store. It was a little more involved than I thought it would be and I can see that with practice you'd get some really great results. 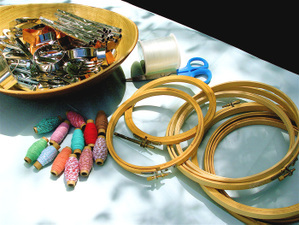 First you lay out your items on the paper in the shade. 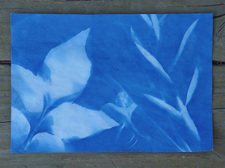 We then covered them with plexiglass to hold the pieces in place and moved them into the sunshine. However, the plexiglass seemed to block some of the sunlight getting through to the paper (you can tell by how the paper is changing color), so we took it off and exposed the papers a little longer. 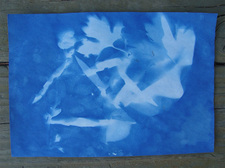 After a few minutes, you develop the papers in a tray of water and then let them dry. They will continue to darken over a couple of days. 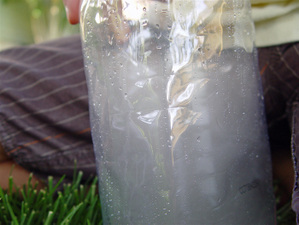 We did a couple of really neat weather-related experiments. We got some ideas from the Steve Spangler website. 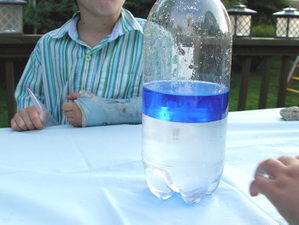 First, we did the "Tornado in a Bottle". It was very easy to set up. I found the Tornado Tube connector at the toy store. We did the lamp oil version using blue lamp oil. The next one we did was very cool, but a bit more complicated. 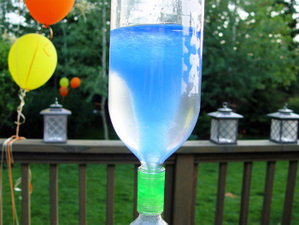 Watch the video on the Steve Spangler site and you'll see a great demonstration of this experiment. I wanted the same "WOW!" factor as the one on the video, but when you read the directions, it's for one using smoke from a match. Not as impressive. So, we managed to put together the experiment as done in the video. 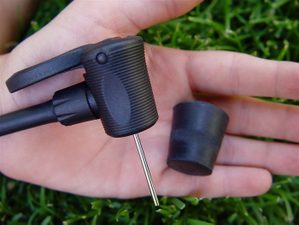 You'll need: a "foot pump" bicycle pump, a #4 stopper (from a hardware store), a tire needle (ours came with the pump), a drill fitted with a #16 drill bit, and a clear 2-liter bottle. 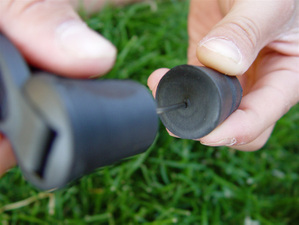 Drill a hole in the center of the stopper and insert the tire needle that's attached to the pump. Add a little bit of hot water to the bottle, then pour it out. All you need are the water droplets inside. Now, place the stopper firmly in the bottle. Someone has to hold it down tight, otherwise it will pop out before you get enough pressure for the cloud. Start pumping the foot pump. 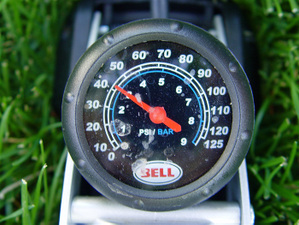 When it gets to 40 PSI, release the stopper and the bottle will instantly fill with a cloud! 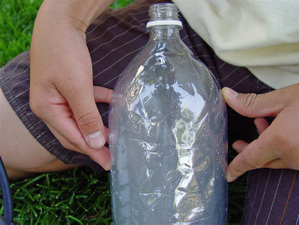 My very patient son, Big Brother, helped me take the "Cloud in a Bottle" photos. 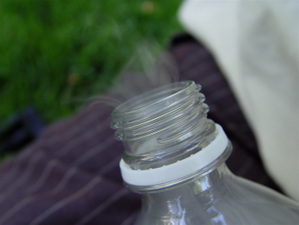 It took a lot of tries to capture the water vapor escaping from the top of the bottle. You can see it a lot better in person, so I'd really suggest trying this experiment. 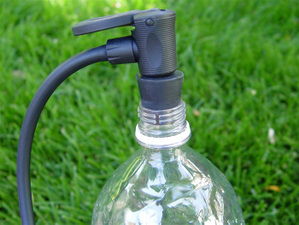 Besides, then the kids can entertain themselves shooting bottle rockets across the yard for the rest of the afternoon! 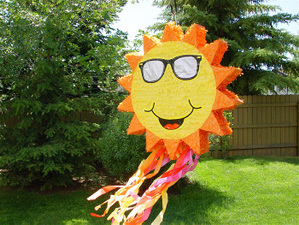 To finish up, we did a sun pinata. A fun, "fair" weather day for everyone! 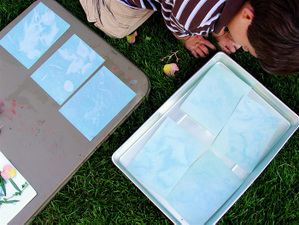 A very fun sun print projekt, but I wonder what type of paper being used. The projekt would be fun to try out next summer when the sunlight is stronger again. Thanks so much for these great ideas and such detail! I'm going to "borrow" them for my son's birthday party, too! That is awesome! My daughter is very "into weather", so we may "borrow" your theme! Great party idea! Loved the windchimes!!! What great ideas! You are so creative. you have awesome birthday party themes and must be a very excellent homeschooler!